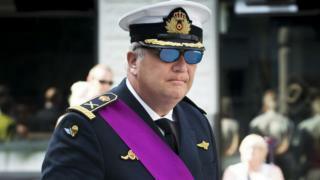 Prince Laurent of Belgium has had his monthly allowance docked for a year, after a vote by the country's federal parliament. The sanction was imposed after the prince attended a Chinese embassy reception last year without government permission, in full naval uniform. Lawmakers voted for a 15% cut to his €307,000 (£270,000; $378,000) annual allowance. The move was suggested by Belgium's Prime Minister, Charles Michel. Mr Michel had previously warned the prince to seek foreign ministry permission before conducting any diplomatic activity. Despite that, the royal went to the embassy event and tweeted a photo of himself there. How did he argue against the fine? Prince Laurent, who is the younger brother of King Philippe, wrote a lengthy emotional letter to parliament before the vote on his endowment, arguing that, as a royal, he is unable to work for a living. He described the vote as "the trial of my life" and said it would "likely cause me serious prejudice" if MPs went against him. "This allowance, the reduction of which is being discussed as a result of political or media currents, is the price of a life - the price of my life, which is largely behind me now," he wrote. The prince, 54, said the royal family had obstructed his attempts to be financially independent. "I even had to get permission to marry, and even today I pay the price for choosing a woman I love, without title or fortune," he wrote in the three-page self-defence. Lawmakers ultimately rejected his claim that no citizen of their country had been so exploited, voting to cut his stipend by 93 to 23 votes. The move is effectively a €46,000 fine. However, some MPs argued that since princes are not obliged to seek an endowment, it should instead be viewed as a deduction from a donation. Prince Laurent is no stranger to controversy and is sometimes termed the prince maudit - the "cursed prince" - in Belgium. He has racked up several speeding fines, and his unofficial appearance at the Chinese event - held for the 90th anniversary of the Chinese army - was not the first of its kind. He had previously been criticised for attending meetings in Libya when the late Muammar Gaddafi was still in power, and making an unsanctioned 2011 trip to the Democratic Republic of Congo, a former Belgian colony. Despite this, he is also seen as a likeable figure, if something of an oddball, AFP news agency notes. The animal lover recently confessed that he wished he could "converse with an octopus or a fly".